Let's go! I'm on the prowl! 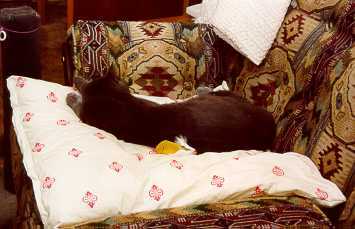 Sammy came into our lives in September 1999, and filled a big void. Our beloved Siamese Brio passed away last September at the age of 17, and we found Sammy at the vet's a few days later, when we came to pay Brio's final bill. We believe it was fate that this beautiful animal was there waiting for us to take him home. 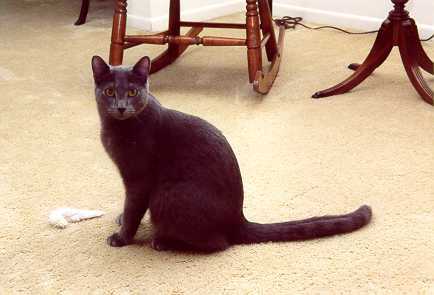 After some research into cat breeds, we have concluded that Sammy is likely a well bred Russian Blue. 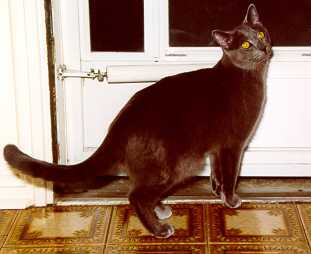 He has the distinctively soft silver tipped coat, the dark whisker pads, and the "tiptoe" walk so characteristic of the breed. 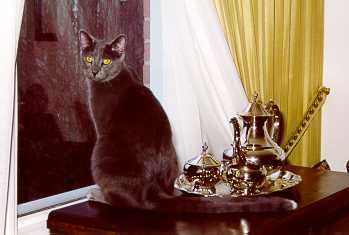 Of course, he doesn't have the pedigree so we can only guess at his lineage. Take out my squeaky toy, I'll join the chase. Now hide those crunchy treats, I'll find their place. I am Sammy! My cousin is a tiger. 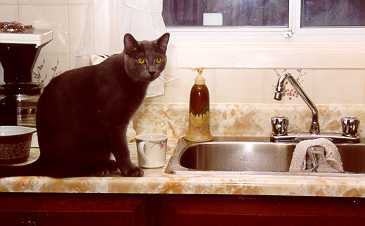 I spy a dripping tap, there in the sink. I leap up, dip my paw, enjoy a drink. I am Sammy! My kin's the roaring lion. I may not be silver, but I look good up here. Perhaps I shall reward you with a purr. I am Sammy! The Pharaoh called me god. Gimme a break! I can't look sharp all the time! The wind howls in the night, I fear no dread. I snuggle next to you and warm your bed. I am Sammy! Tonight I sheath my claws.